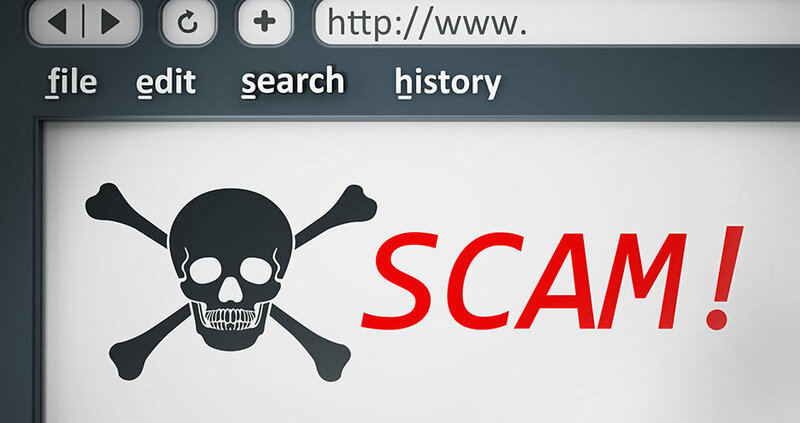 A warning has been issued to Irish owners of domain names to beware of scam emails which attempt to persuade them to register domain names at extortionate prices. Recipients report that the wording of the emails is the same in all cases, suggesting that they are the result of a mass mailing campaign. The emails purport to come from a company called 'DNS Ireland'. Each email refers to a domain name currently held by the recipient (“Our system shows that you are the owner of …”), and claims that the sender has received a request from a third party to register the same name in another domain, usually .COM, .EU or .INFO. The email warns that this could have “far-reaching consequences for you in the future” and claims that the sender is “under the obligation to contact you, in order to offer you the first right of registration”. 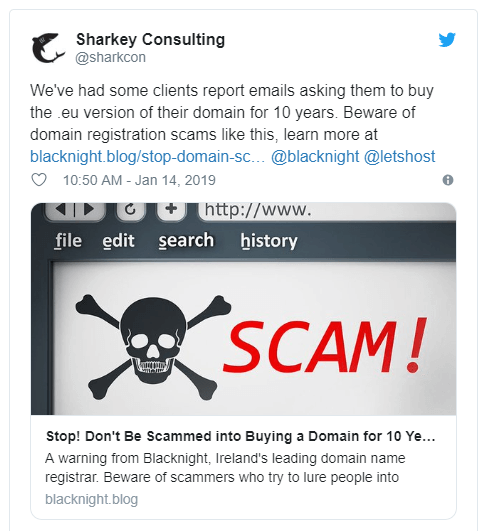 “It’s a con – pure and simple”, says Michele Neylon, CEO of the largest Irish-owned domain registration company Blacknight. “Firstly, there is no such thing as an obligation for domain registrars to track down potential rights holders with similar names in other top-level domains. It’s nonsense to suggest that, and a blatant attempt to frighten people into handing over money quickly without thinking things through”, he explained, noting that the message states that the recipient must reply “within 48 hours”. “Secondly, their prices are a rip-off, and they try to milk it by strong-arming you into handing over €200 for a 10-year registration”. Mr Neylon described the rates quoted as “wildly overpriced”, pointing out that market rates for .COM and .EU domains are only a fraction of the prices quoted by DNS Ireland. “Our advice is to shop around – and don’t be fooled by someone who is trying to con you into thinking they are doing you a favour”, he added. Prompted by a flood of queries from worried customers, Blacknight published a post on its company blog to warn the public about the deception. Under the headline ‘Stop! Don’t Be Scammed into Buying a Domain for 10 Years’, the company explained why the emails are not to be trusted. 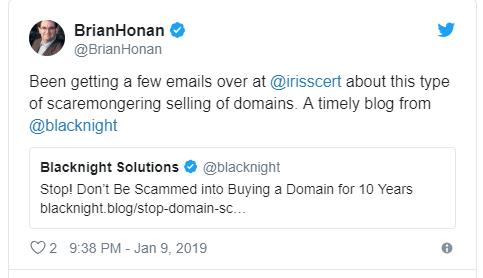 ‘While they may not be entirely fraudulent, these emails are certainly dishonest and misleading, and could lead people to pay far more than the market value, for domain name registration services that they most likely don’t need. The Blacknight warning was shared by several people* on social media, including experts in business and internet security. According to Michele Neylon, the scam is not new. Versions of it have been reported targeting domain registrants in the Dutch (.NL) and Belgian (.BE) country code domains, and it is likely that the scam originates from outside Ireland. “There’s a clear attempt to masquerade as an Irish company; the website claims to have an address in Blanchardstown, and the emails are apparently signed by a guy called Liam, but there is no company with that name on the Irish register”. It’s unclear where the email authors are getting contact information for the Irish domain owners. Under GDPR rules introduced last year, personal contact details for EU citizens is no longer included in public 'Whois' records. There is speculation that they may be using historical records published before GDPR took effect, or they may be simply copying contact details from the websites on the domains they are targeting. 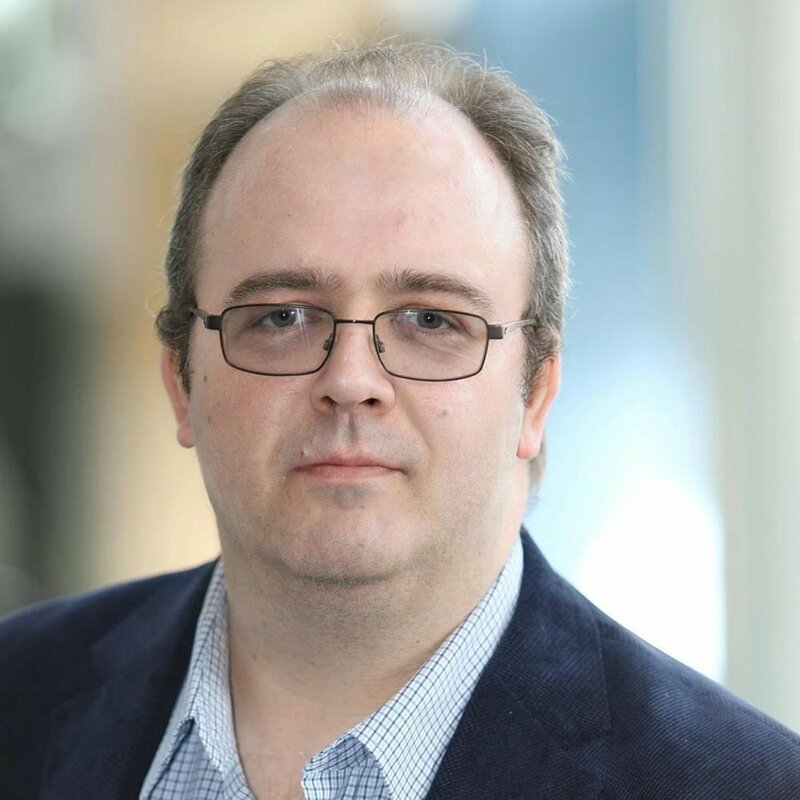 The emails exploit some common misunderstandings about intellectual property rights and trademark protection, he says, but he points out that domain name registrars “are not the trademark police”, and people should seek proper legal advice when it comes to brand protection. “Reputable domain registrars adhere to fair trading practices, and customers should seek to deal with registrars who are accredited with ICANN, the international organisation responsible for internet names and numbers”. There is no such thing as a “first option” for rights holders in domain name registration. Domain name registration is highly competitive. Shop around. Compare prices. Don’t take the word of a stranger who tries to imply that they are doing you a favour. One year? 10 years? If you are unsure how long you will require a domain name, choose one year (and set your account to renew automatically unless you change your mind). Check the bona fides of any company you are dealing with. Ask your friends and business associates. For a registrar of generic domain names like .COM, are they accredited by ICANN? Are they rated on independent review sites?